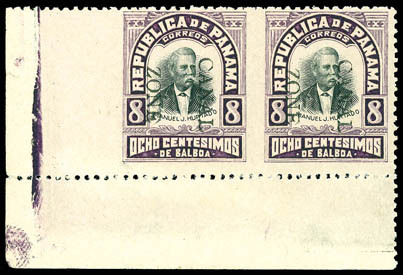 1904, 10c yellow, used single along with a normal 10¢ yellow (3) and 2¢ rose (1), each tied by "Canal Zone, Culebra, Jul 6, 1904" cds on blue cover to Gorgona, reverse with purple Jul. 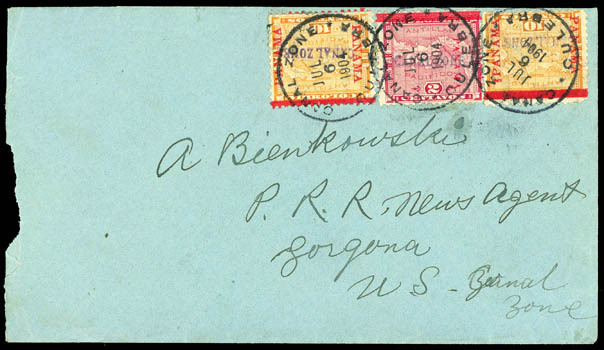 6th 1904 arrival backstamp; cover opened roughly at left, F.-V.F., ex-Salz. CZSG No. 3.3, 3, 1. Scott No. 3 var. Estimate $750 - 1,000. 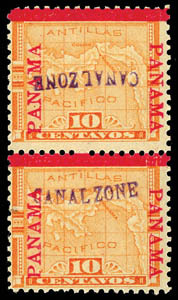 1904, 10c yellow, "CANAL ZONE" inverted, in vertical pair with normal, tropicalized o.g., rich colors, bright and fresh, Very Fine and choice. Scott No. 3a $1,175 for singles. 1906, 8c purple & black, imperf between and at left margin, 6.75mm spacing, bottom margin pair, rich colors, centered a bit to top as always, o.g., small tear in left selvage only that could easily be trimmed, F.-V.F., only 34 examples of this error were issued., ex-Salz. CZSG No. C25a. 1912, 2c vermilion & black, inverted center, overprint reading down, bottom right corner margin block of 4 with part imprint, full o.g., bottom left stamp never hinged, wide margins, fresh with rich colors, Very Fine. Scott No. 39e $2,600 for hinged singles. A RARE MINT MULTIPLE OF THE 1912 2¢ INVERTED CENTER WITH OVERPRINT READING DOWN. 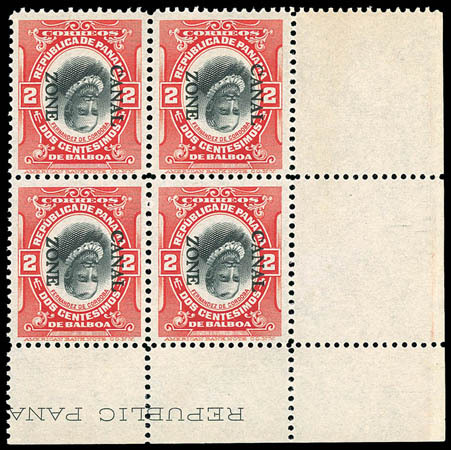 1926, 2¢ carmine, missing overprint, in left sheet margin pair with normal, brilliant color, typical centering, o.g., never hinged, fresh and Fine, ex-Salz. CZSG No. 97a. ONE OF ONLY 10 RECORDED MISSING OVERPRINT PAIRS, OF WHICH AT LEAST FOUR ARE CONTAINED IN BLOCKS. Airmail Official, 1947, 6¢ yellow brown, type I, inverted overprint, roller precancel as always, position 27, o.g., never hinged, bright and fresh with bold color, F.-V.F. ; with Kessler backstamp. 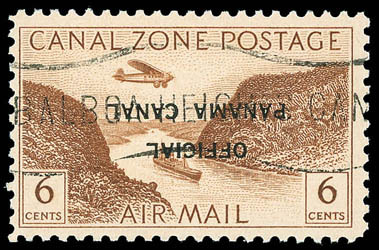 RARE WITH ONLY FIFTY EXAMPLES OF THE AIRPOST OFFICIAL 1947 6¢ WITH INVERTED OVERPRINT ISSUED. Postage Due, 1925, 10¢ carmine rose, missing overprint, top left corner margin block of four with the top two stamps missing the overprint, vibrant color on fresh paper, o.g., bottom stamps never hinged, Very Fine, ex-Salz. CZSG No. J20a. 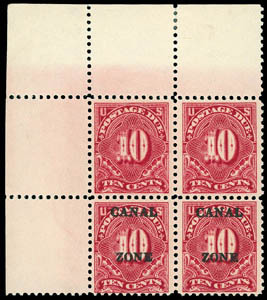 A CHOICE EXAMPLE OF THE 10¢ CARMINE ROSE MISSING OVERPRINT ERROR IN A BLOCK OF FOUR, ONLY 10 EXAMPLES EXIST. This error was produced when the overprint was shifted down one row on an upper left pane, therefore only ten error pairs were made, including three that are contained in a plate block, as well as the two in the block offered here.